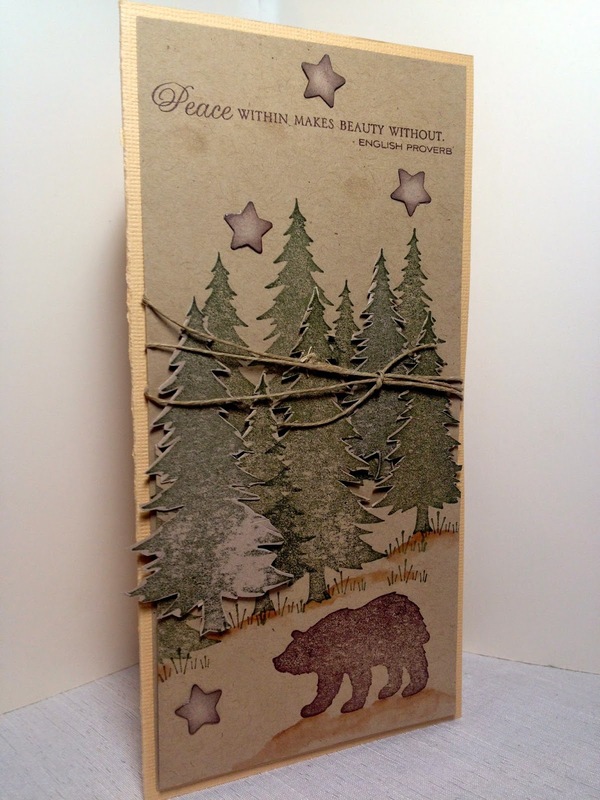 My main images are from retired Stampin Up! "Definitely Decorative Pines". It's uncanny how similar the images are to the new "Northwoods 2" designs. 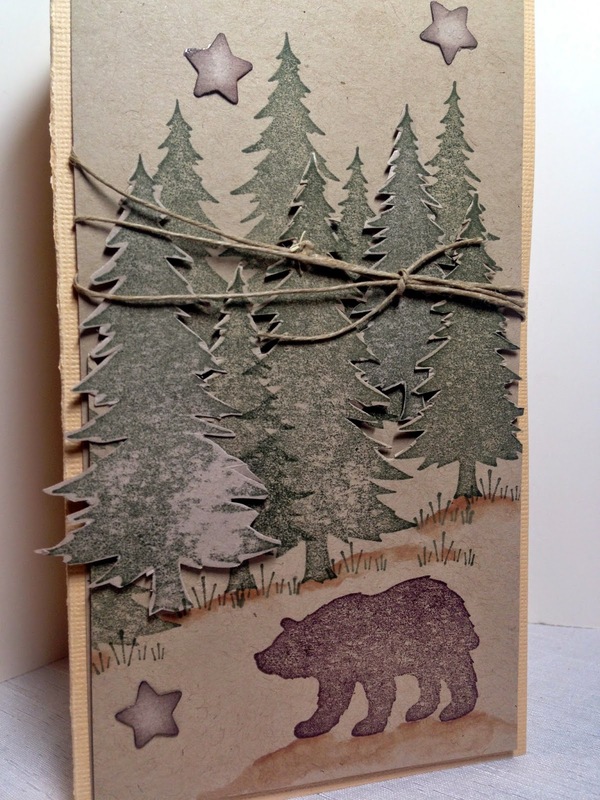 But really, how many different ways can you make a pine tree or a solid bear image? The biggest difference I see between the two sets is the size, and the Stampin Up! pines are fuller. 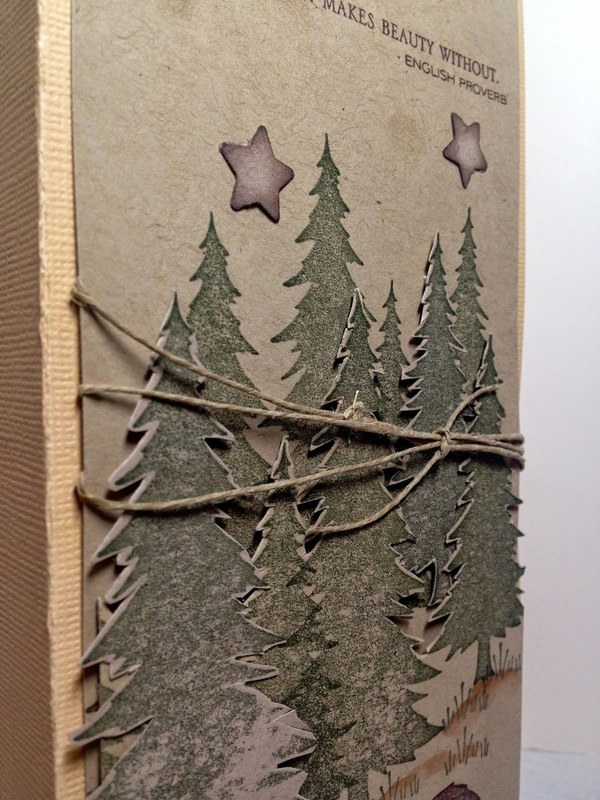 To make the card, I stamped the pines with Always Artichoke ink onto Kraft card stock. I then stamped a bunch of other pines separately, cut them out, and put them up on dimensionals over the other trees. I added grass using an unknown grass stamp, then colored in some dirt hills with a Copic Marker. I liked Debbie's extra touches of string and stars, so I added those as well using hemp from my stash and punched out paper stars. I inked the edges of the stars with Chocolate Chip ink to make them stand out more. The bear was stamped directly on the Kraft panel and I also colored in a little dirt hill for him to stand on as well. The sentiment is from PTI "Through the Trees". Paper crafting can be an expensive hobby. Most of us already own more stamps, paper, and dies than we could ever even use in a life time, and because we have so much 'stuff' we often have to create and devote entire rooms in our homes to house it all. I know I do! It is hard to resist the temptation of always wanting to buy the 'new stamps' or the 'latest images'. The next time a new stamp set comes out and the divas start to creating fun new cards you want to case, instead of rushing to buy the new stamps, look at your old stamps first and see what you have that could possibly replicate that look. It's better for your pocketbook and the environment, because you using what you already have instead of buying new. Beautiful CASE-D card! I completely agree with you about repeated stamps. Even though I've only been papercrafting for 7 years, I've already noticed repeated stamps from different stamp companies. Like you said the only real difference is the size and sometime it's an outlined image instead of a solid image. I have been ordering from Stampin' Up for a long time so I've really notice something from them. For eample, their designs from their 2007 catalog and their current catalog, some images are tweaked a bit and added different sentiments or they change the font of the sentiments. So now if I REALLY like the images in a set, I always check my stamps first. It sure save me TONS of money. Have a wonderful day! Wow ! love the design of this card, a real beauty !